NASHVILLE, TN — Last week The Metropolitan Nashville Airport Authority (MNAA) and Mayor Megan Barry unveiled the new look, feel and design of BNA Vision, the growth and expansion plan for Nashville International Airport (BNA). 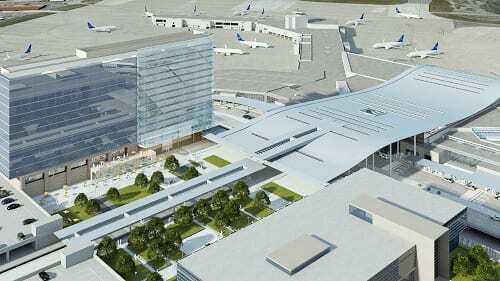 Through video, renderings, a 3-D model, and a dynamic virtual reality simulation, Music City got its first detailed look at the final plans for the renovation of the terminal and new plaza at BNA, including a hotel and transit station to accommodate plans for future light rail. In July 2016, MNAA first announced the preliminary plan for BNA Vision, releasing conceptualimages and articulating the need for a major airport expansion in response to steep passenger increases and robust regional growth. The past year has been a period of intense planning and design, led by Corgan, an acclaimed architecture and design firm internationally known for its expertise in major aviation and commercial projects. Through this process, the original conceptual images have now given way to the final architectural renderings, revealing the actual look, feel and features of the proposed renovation.